Class 11 have been looking at some of the works of William Shakespeare as part of the preparation for the GCSE Entry Level exams. The students should now be familiar with Shakespeare as a writer. We have been looking at some of his own bibliographical information, as well as examining his choice of language. The students have just started work on looking at the complex story of Macbeth to start off our English work for the spring term. Class 11 have looked at the main characters in the story. The pupils have worked together to produce a class spider diagram involving the main characters. We have asked for the names, an explanation of their role in the play and some information that explains their relationship with other characters. 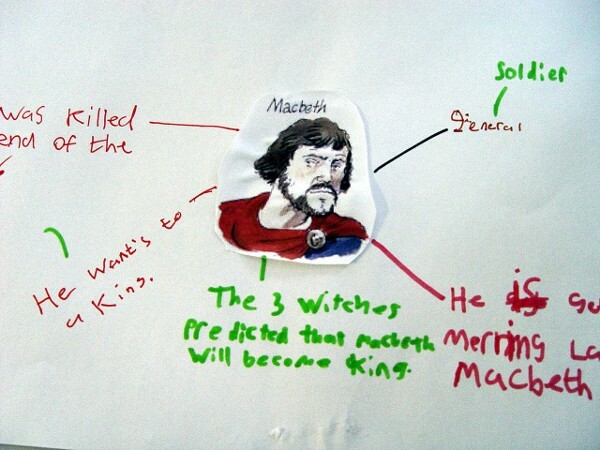 Class 11 have seen how motivations play an important part in the Macbeth story. Other work has included the pupils describing what each character wants to achieve, and how they go about this. The teaching staff are finding that this is a very useful approach to help the students understand the plot. We encourage Class 11 to expand their vocabulary with new words such as guilty, paranoid, tragedy and ambitious. The Macbeth storyline will be explored in greater detail over the coming weeks as we continue our GCSE Entry Level preparations in Class 11. The students will be asked to write their opinions as they evaluate each character.